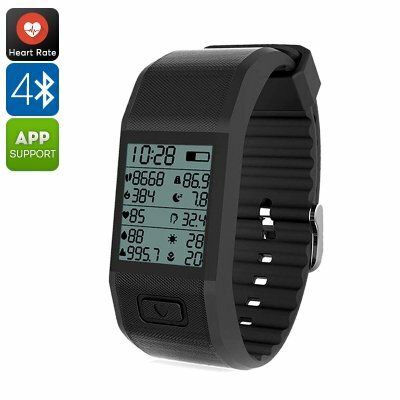 Successfully Added Hesvit S3 Fitness Tracker - Pedometer, Skin Humidity, Skin Temperature, Calories Burned, Distance, Sleep Monitor, Heart Rate to your Shopping Cart. The Hesvit S3 smart band fitness tracker is a sophisticated Bluetooth watch that treats you to an abundance of smart health features. Via Bluetooth, it lets you connect your wristband to both iOS and Android phones. The watch itself packs a 60mAh battery that brings along up to 7 days of standby time. Thanks to this, you’ll be able to use it during the week without needing to recharge your Bluetooth watch. It features a sleek design and has been crafted out of soft material – making it comfortable to wear throughout the day. Your fitness tracker bracelet comes equipped with a highly-accurate pedometer. This feature keeps track of your daily exercise levels by informing you about the distance that you have covered, steps taken, and calories burned. Therefore, you can be guaranteed that you’ll always hit the required daily level of activity in order to stay fit and healthy. The Bluetooth watch furthermore comes with a heart rate monitor, skin temperature, and skin humidity sensor. Together, these features treat you to highly valuable information based on which you can adjust the intensity of your future workout sessions. With all this info at hand, you’ll be able to reach your desired fitness levels in up to no time. For the outdoor lovers among us, the Hesvit S3 fitness tracker comes with a barometer. It furthermore features an IP65 waterproof design. This makes your Bluetooth watch resistant to water, drops, and dust. You’ll be able to wear this beauty anywhere you go without ever needing to worry about accidentally breaking it. The Hesvit S3 fitness tracker comes with a 12 months warranty, brought to you by the leader in electronic devices as well as wholesale Bluetooth watches..